The federal budget crisis has put a halt to some ship deployments, but the 2,200 Marines and sailors with the 26th Marine Expeditionary Unit soon will head out to sea. 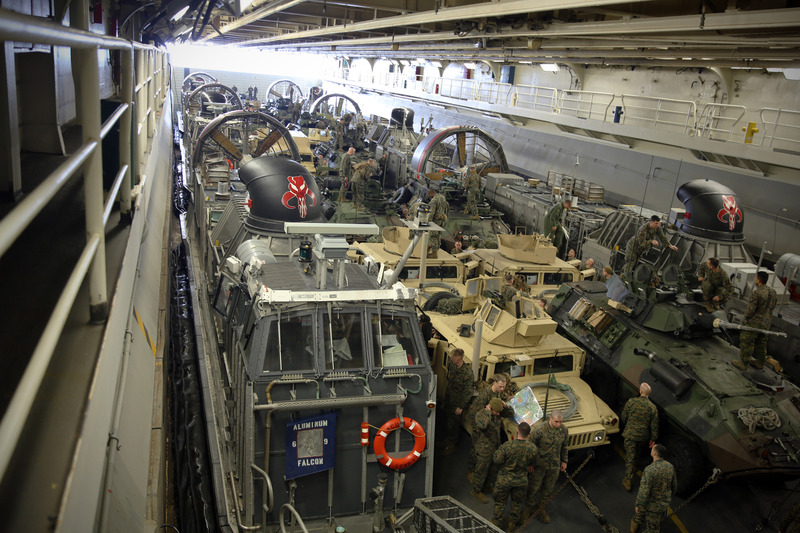 The Camp Lejeune, N.C-based 26th MEU will board three amphibious ships for the scheduled overseas deployment to the Mediterranean and Persian Gulf regions, U.S. Fleet Forces Command announced March 5. The 26th MEU, commanded by Col. Matt St. Clair, recently wrapped up its predeployment training and certifications with the Kearsarge Amphibious Ready Group. So over the coming days, Marines are departing Camp Lejeune to board their three ships – amphibious assault ship Kearsarge, transport dock ship San Antonio and dock landing ship Carter Hall – and begin the deployment, “part of a regular rotation of forces to support maritime security operations, provide crisis response capability and increase theater security cooperation and forward naval presence in the U.S. Navy’s 5th and 6th Fleet areas of operation,” U.S. Fleet Forces Command officials said in a news release. The 26th MEU includes a battalion landing team led by 3rd Battalion, 2nd Marine Regiment, Marine Medium Tiltrotor Squadron 266 (Reinforced) and Combat Logistics Battalion 26. So what will the blue-green team do once they deploy? Just what missions they might do for real remain to be seen, of course. 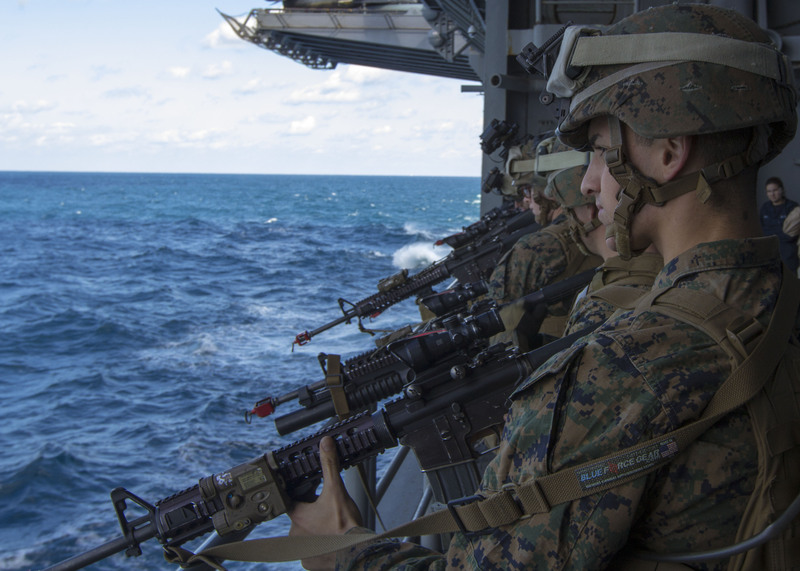 The MEU is one of the Marine Corps’ seven seagoing expeditionary units, scalable Marine air-ground task forces that give regional combatant commanders a go-to force, the “theater reserve” that’s primed and ready to respond to a wide range of missions. That could be evacuating Americans from nations in crisis, delivering food and water to disaster zones, rescuing downed pilots or striking enemy targets. To Marines, MEUs at sea are the nation’s “9-1-1 force,” the pointy end of the spear. Typically, two of the six stateside MEUs — the 22nd, 24th and 26th MEUs based at Camp Lejeune and the 11th, 13th and 15th MEUs based at Camp Pendleton, Calif. — are deployed overseas, with the others training up to deploy or throttling down after returning home from deployment. They often spend time in the Mediterranean and in the Persian Gulf and Arabian Sea, dictated by operational requirements and national priorities. Last year, Marines with the 24th MEU spent much of the deployment aboard their ships on high alert, preparing for possible missions as tensions heated up across Africa and the Middle East. In the three months since they returned to Camp Lejeune, and through most of the winter, no MEU/ARG cruised the Mediterranean, even as tensions and crises in Syria continued to flare. The 15th MEU remains operating in the U.S. Central Command region with the San Diego-based Peleliu ARG. Meanwhile, the 31st MEU, based in Japan, continues to conduct shorter deployments in the western Pacific, usually during shipboard patrols with the Navy’s forward-deployed 7th Fleet. Sometimes, that “9-1-1” call can come close to home. In early November, while knee-deep in predeployment training, the 26th MEU was tasked to help as part of the Hurricane Sandy disaster relief response. About 350 members of the MEU rode in helicopters and MV-22 Osprey tiltrotor aircraft and boarded amphibious assault ship Wasp, off the coast of New York City, where they helped with cleanup efforts for nearly two weeks, an unexpected adjustment to their training schedule.